Oh Lizzie, Lizzie, Lizzie, what have you done, Lizzie. Seriously, WtF? Excuse me, “of Mice and Men” anyone? I am completely and totally traumatized. Last week’s episode seems like a picnic in the park by comparison. Yes, last week left you wondering if Daryl will feel he’s finally with his kind of people kind of thing, and what in heckfire was going on with Beth that she would just drive off like that? But still, it’s small potatoes compared to what went on in this episode . . . excuse me while I take a moment . . . Yes, that was an extremely emotional episode. I kinda wondered, from the previous episodes, if they were just switching out Lizzie and Mika for the twins in the comic, but I really didn’t expect them to go that far. I’ve heard it rumoured that the season finale is going to be really, REALLY intense. That this last episode will be a walk in the park compared to it. Yes, I’ve heard a lot of people making the Lennie Small comparison, but his was accidental, and not premeditated. Unless the comparison was meant more towards someone having to make the decision of what to do with the violently disturbed not being able to function (as well as being a danger) in ‘society’? Just look at the flowers, Helldin, just look at the flowers . . .
HELLdin does not use MeisterfröhlichHenkersbeil on living things. It’s merely to look formidable. and that’s Fräulein HELLdin to you. The actresses, Brighton Sharbino (Lizzie) and Kyla Kennedy (Mika), wrote and sang a song about their characters. It appears Daryl has had previous experience with the undead…of a different sort. ‘….I’d rather be a pet, than cattle’. Didn’t turn out so good. Hahaha, that’s excellent. I totally forgot Norman was even in Blade II. Guess that goes to show what a good role can do for your profile . 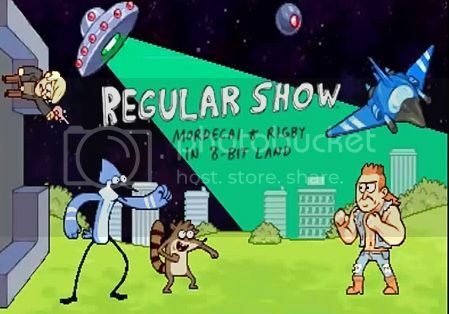 . .
Got the Regular Show for the 3DS earlier today. Does the guy on the far right look like a blend of Abraham Ford and Eugene ‘the mullet’ Porter from WD, or is it just me? Zombie repellent ‘perfume’, of course! E. Coli? Yeah, tweaking that would probably have no ‘ill’ effects. There is that plant that is supposed to smell like rotting flesh that would be good to plant around your house, I suppose, and maybe eating A LOT of gassy foods, too!?! First thought that occurred to me when they waltzed into Terminus and found Star Trek – NG’s Tasha Yar all by her lonesome grilling up steaks on the grill? Cannibals . . .